Culms: Erect, solitary or clustered, stout, coarse, hollow, glabrous. Blades: Flat or rolled inward, 12 to 48 inches long, 1/4 to 1/2 inch wide, prominently ridged above, glabrous; margins rough toothed; tips tapered to slender points. Sheaths: Crowded below, overlapping, firm, glabrous to slightly ribbed. Ligules: Short fringes of hairs. Inflorescences: 8 to 18 inches long, consisting of 5-32 spikes; spikes often short-stalked, 1.5 to 5 inches long, ascending to erect. Spikelets: Sessile, to 40, crowded, overlapping in 2 rows along 1 side of each spike, flattened laterally, 1-flowered; first glume pointed or short-awned; second glume with awn to 1/4 inch long. Habitat: Moist low ground, ditches, marshy areas, and along streams. Forage Value: Of poor forage value when mature but can be grazed by livestock during its early growth stage and produces moderate-quality hay when harvested before the stems develop. Uses: Prairie cordgrass is fast-growing and has been used to prevent soil erosion. 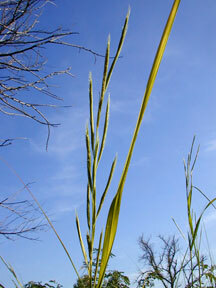 Stems often remain erect through the winter and provide good cover for wildlife. Red-winged blackbirds nest in it. Native Americans and early pioneers used prairie cordgrass as a roof covering for dwellings. Comments: Rhizomatous. The grass is sometimes called "ripgut" due to the pointed teeth along the blade margins, which can cut skin.